Poducts - Record Play Tek INC. - RPT designs and builds digital voice recording, digital voice logging, and retrieval systems. 175 Days of voice history on the hard drive for 9 channels. 18, 27 channels available. Record phone lines, phone instruments, radios, scanners, room mics, T-1's and any kind of audio, continuously. Integrate into your current LAN/WAN and play conversations from anywhere in the world. Very simple screens and operation, with instant recall of "just occured" events. Serviced by any computer technician of your choice or by RPT in Bristol. Easy telco "66 block punch down" for telephone and radio 2 or 4 wire interface. CDR or DVDR backups done automatically, using 80 Cent consumer DVDR's. RPT factory people available for on site installation assistance and training. All voice cards and software designs completely owned and made by RPT. 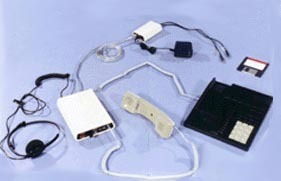 Many optional accessories to integrate SMDR (Station Message Detail Reports) phone information, Startelr, Telescanr account codes, beep tones, or caller ID with the SCL 8900 Voice Logger. Order factory direct or from an RPT franchised distributor or dealer. 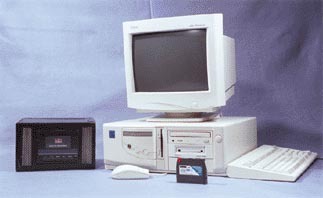 One or two channels of recording via the Sound Blaster on an existing office or home computer. Compatible with any telephone system - digital or analog, telephone line or telephone instrument. Can be utilized to record from a 2-way radio or scanner. Is easily installed as a background program on your existing PC. Intense audio signal processing to "bring up" the soft talkers. Provides days of recording capability with instant recall. Compatible with Windows 3.1/95/98/NT/2000/XP Pro operating systems. Voice activated recording provides minimum storage requirements. Automatically records ( or on/off record software switch available) and just click to play, no passwords needed. Systems are inexpensive, and self installed. Supplied with the every 15 second, "you are being recorded" beep tone. You will need... A Pentium 11 or higher computer, Windows operating system; A Sound Blaster sound card; 128 meg or higher RAM; 250mb cache memory; 10 GB or larger hard drive; CDR Drive; monitor; mouse; and keyboard. Record / Play Tek Inc.